GLENS FALLS, NY – The Worcester Railers headed to the Empire State Sunday to take on the Adirondack Thunder in the final regular season game for both teams. While the Railers were playing just for pride the Thunder needed a point to clinch home ice in the first round of the ECHL’s North Division playoffs in their best of seven series against the Manchester Monarchs. The Thunder would get on the board first while on the power play–and while this writer and a handful of others were still at Davidson Brothers Brewing Company enjoying lunch–when Kelly Summers sent a cross zone pass high in the Railers zone over to John Edwardh at the left point. Edwardh’s blast beat Worcester goaltender Mitch Gillam clean at 10:29. Ivan Chukarov got his team on the board at 2:35 of the second with his first of the season after playing some heads-up hockey. With the Thunder trying to play some transitional hockey Drew Callin managed to keep the puck in the Adirondack zone by flipping it over to Ryan MacKinnon at the right wing point. With no defender close to him Chukarov headed to the net, and MacKinnon hit him in stride with a nice diagonal pass through the zone. Chukarov went sick side on Alex Sakellaropoulos from just outside the low circle and it was 1-1. After waiting 15 games to score his first pro goal Chukarov decided that he’d get his second a little quicker, and after a clean face-off win by Ryan Hitchcock right to the defenseman Chukarov skated in a bit and fired one through traffic and past Sakellaropoulos at 7:28. It didn’t take long for the Thunder to answer right back when Edwardh beat Gillam to the stick side and just inside the far post on a shorthanded two on one break in for Adirondack at 8:39. The Railers retook the lead at 10:24 on a nice break into the Thunder zone. Ross Olsson fired a shot on goal that was kicked out by Sakellaropoulos, but the puck went right to Tommy Kelley, who backhanded it into the goal for the 3-2 Railers lead. Josh Holmstrom had the secondary assist. 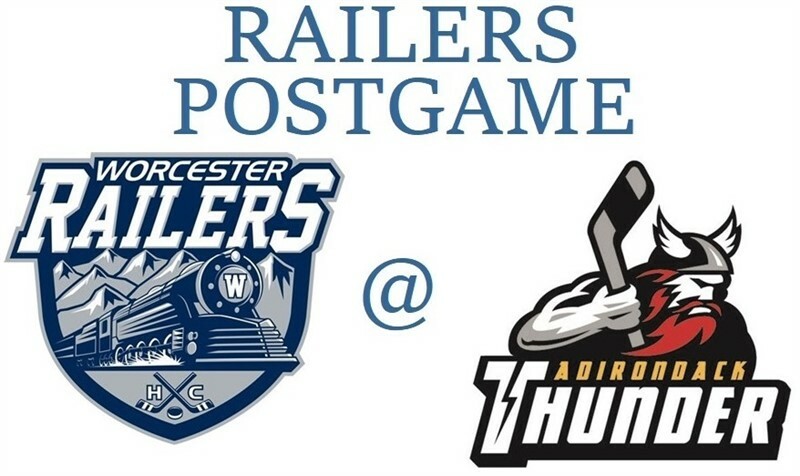 Two early third period goals by the Thunder, the first by James Henry at 3:08 and the second by Matt Salhany at 4:27, put Worcester down a goal. With time winding down in the game and on the Railers season Hitchcock would give the Worcester faithful who made the three-plus hour trek to Glens Falls some bonus hockey when the rebound of Nick Sorkin’s shot hit the post and bounded right to the rookie forward. After holding the puck for a second or two Hitchcock fired it off of Sakellaropoulos as both the netminder and puck went sliding into the cage. With the Railers sticks in the air celebrating referee Chris Pontes scrambled to the back of the net to get a better view, and emphatically signaled good goal. With the game entering overtime the Thunder fans were happy as they’d officially clinched home ice in round one, and the Railers fans went home happy when Matty Gaudreau carried the puck from behind the Adirondack net to the slot where he beat Sakellaropoulos to give Worcester the 5-4 win. Scratches for the Railers were Bo Brauer, Evan Buitenhuis (14-day IR/lower), Kyle McKenzie (14-day IR/season), Tommy Panico (14-day IR/season), Rob Powers, Matt Schmalz, Yanick Turcotte (suspended/game 2 of 2), Alex Vanier (14-day IR/upper), and Blake Wojtala (upper body). With Wojtala being held out the Railers signed Ryan Hubbard as an emergency back-up goaltender. With all 72 games in the books the Railers have their first “Iron Man” as Barry Almeida played in every game this season. He’s the first player to play in all his team’s games for a Worcester team since Matt Taormina did it for the WorSharks, playing in all 76 AHL regular season games and the four playoff contests in 2014-15. Kyle McKenzie came close last season for the Railers, missing just the game on January 2, 2018 vs Wheeling as a healthy scratch. Tyler Barnes came close this season as well, missing just one game due to an illness last Wednesday against Manchester. In news broken by 210 Sports on Twitter after yesterday’s game, Tyler Barnes is retiring from pro hockey. Despite having the news confirmed by others close to Barnes before the game started it wasn’t until after the game was over when Barnes could confirm it himself that we broke the news. When asked if he had anything he wanted to say about it Barnes said, “I just want to thank all the fans, they’ve been great to me over the years.” I also spoke to Barnes’ parents, who wanted to pass along their thanks to the Worcester fans for all the support they’d given Tyler this year. On this day, April 8th, in Worcester hockey history: in 2000 Daniel Corso scored twice and added a pair of assists as the Worcester IceCats handed the Providence Bruins their eighth straight loss, 6-2. Corso scored with 8:17 left in the second period, giving Worcester a three-goal lead, then closed the scoring with 48 seconds remaining. Jim Campbell added two goals and an assist for the IceCats. Brent Johnson turned away 34 shots to record his 24th win…in 2005 Jeff Hoggan scored with 1:02 remining in regulation and Jay McClement scored an unassisted game-winner at 2:04 of overtime to give the IceCats a 4-3 win in Springfield against the Falcons. The goal was McClement’s second of the game. Matt Walker had the first goal of the contest by Worcester, and is was also unassisted. Curtis Sanford made 21 saves in the win…in 2009 the WorSharks got a first period goal from Ryan Vesce and a third period tally by Dan DaSilva to defeat the Portland Pirates 2-1. Thomas Greiss had 24 saves in the victory. Railers Head Coach Jamie Russell jumbled the lines for most of the game, apparently giving players a chance to play together on lines that they wouldn’t ordinarily play on. 1st Period-1, Adirondack, Edwardh 26 (Summers, Bergin), 10:29 (PP). Penalties-Ward Adk (tripping), 2:50; Chukarov Wor (hooking), 8:33; Almeida Wor (slashing), 11:51; Olsson Wor (double – roughing), 14:05; Carrier Adk (double – roughing), 14:05. 2nd Period-2, Worcester, Chukarov 1 (MacKinnon, Callin), 2:35. 3, Worcester, Chukarov 2 (Hitchcock), 7:26. 4, Adirondack, Edwardh 27 (Summers), 8:39 (SH). 5, Worcester, Kelley 7 (Olsson, Holmstrom), 10:24. Penalties-Cornell Wor (tripping), 6:23; Conacher Adk (interference), 7:22; Holmstrom Wor (slashing), 10:35; Bradshaw Adk (boarding), 17:12. 3rd Period-6, Adirondack, Henry 15 (Sdao, Ward), 3:08. 7, Adirondack, Salhany 15 (Cleland), 4:27. 8, Worcester, Hitchcock 17 (Sorkin, Almeida), 18:40. Penalties-Cornell Wor (high-sticking), 15:17. Shots on Goal-Worcester 7-10-5-2-24. Adirondack 13-13-9-1-36. Power Play Opportunities-Worcester 0 / 3; Adirondack 1 / 5. Goalies-Worcester, Gillam 21-16-2-3 (36 shots-32 saves). Adirondack, Sakellaropoulos 19-6-4-1 (24 shots-19 saves). Linesmen-Matt Brady (42), Neil Frederickson (54).